***Jeep Wrangler unlimited Sahara 4WD*** Auto, Dual Top, Tow, Org MSRP of $41,255!! 1-OWNER... NAV... Priced to SELL!! 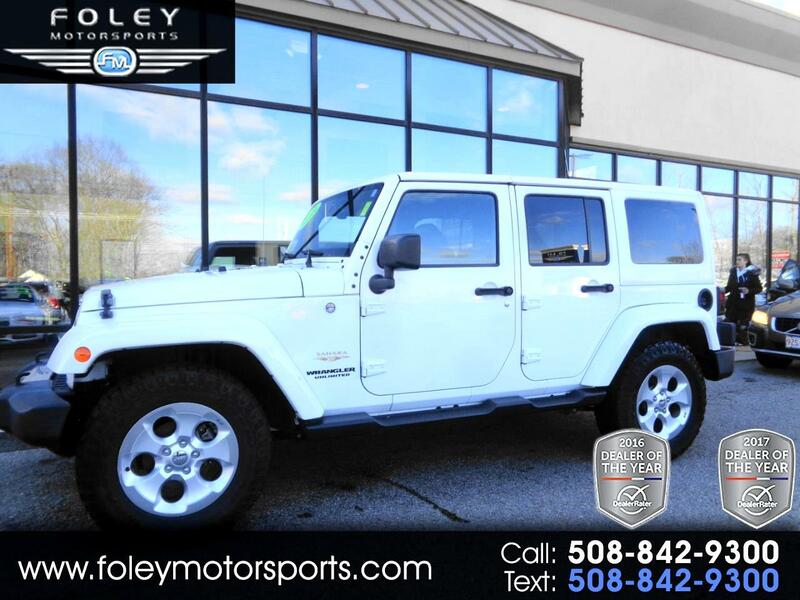 2015 JEEP Wrangler Unlimited Sahara 4WD... Bright White Clear Coat on Black Leather Trimmed Bucket Seats... Automatic Transmission... Sahara Package 24G... Connectivity Group... Dual Top Group... Trailer Tow Group... GSP Navigation w Sirius XM... Remote Keyless Entry... 18'' Polished Satin Carbon Wheels... ONLY 74,984 Miles!! ***ORIGINAL Sticker MSRP of $41,255*** CAR FAX Certified 1-OWNER Vehicle with Complete bumper to Bumper Inspection and Jeep factory Powertrain Warranty Coverage Included!! Please feel free to contact our experienced sales team with ANY questions or to schedule a test drive. Buy with confidence from the area LEADER in Pre-Owned LUXURY. Additional 5 Year/100K Extended Warranty Coverage Available. ALL of our vehicles are meticulously detailed and serviced by our factory trained certified technicians. Call or email us at sales@rjfoley.com **$0 Down** 100% financing available with great rates! Trades are always welcome. National and International shipping quotes are available.